So, 2017 is almost history. We are going to start a new year, a whole new 365 days to do stuff and try and find happiness, success and love. A new year to revolve around our sun, the star that is essential to all life on our planet. A new year to get things done. Or will it be a bad year? 2016 was a crappy year for some and 2017 was also crappy for some. For me it’s been a so-so year. I applied for a promotion and change in process at my place of work and went through the interview process and presentation round and I got it. I was informed that I was selected by the end of February and that I would stay in my current process till the end of March. So April 1st I start in a new post with a slightly better pay package and a small promotion. Work has been fun at times though we have had some really long hours at work and fluctuating work shifts. I turned 41 in the middle of it and I really have started to feel the effects of late work hours on my body. I need more time to get ready and more time to relax as the late hours are beginning to take a toll on me. I can’t think of personal things to talk about. I don’t think I have much of a personal life, other than going out, either alone or with a cousin, getting some good food and watching a few movies. I now prefer to spend my weekends at home and go out less. I hope I have some excitement coming my way soon. I could use some. Have a great 2018! There are a few that I think would make it to this list if I had been able to see it like The Shape Of Water, Star Wars : The Last Jedi & maybe Dunkirk – I really doubt the last one as I am not usually a fan of war movies and I don’t get the James Nolan hype. Oh boy! I am so tired once again. I have worked three different work shifts in three days. And I have sacrificed one of my off days to get some stuff done because ofcourse everything in this process is at the last moment and not really organized at all so I end up doing stuff like this. Thursday I worked a 9pm to 6:30 am shift and came home by 7 am and slept. Then I went back to work at 5:30 pm yesterday and I worked till 1am. Then I came home and watched tv for a bit and then went to sleep. I woke up today at 8:15 am as I have to be at work by 10:30am or 11am. So tired and weary and just wanting to finish the work and come back home quickly. But you’d think that if I am coming to work on my day off for conducting sessions, they would make sure that they arrange those folks for me. But no, it was so haphazard and disorganized that for the 10:30 am session I only got people by 11:55 am and for the 1:30 pm session I only got people by 2:45pm. That is ridiculous! What a waste of time. Anyway, I am back home and drinking a beer. Cheers! Arsenal boss Arsene Wenger says he is not worried about losing Alexis Sanchez in January despite the forward scoring twice as the Gunners won at Crystal Palace. After Andros Townsend cancelled out Shkodran Mustafi’s first-half opener, Sanchez struck twice in four minutes. The Chile forward squeezed a clinical strike in at the near post to make it 2-1 before bringing Jack Wilshere’s superb ball from his own half under control and flicking into the net. James Tomkins headed in late on but Sanchez’s double was enough to secure a win that keeps sixth-placed Arsenal level on points with Tottenham, who are fifth, and one point behind fourth-placed Liverpool. Sanchez’s contract expires at the end of the season and the 29-year-old has been linked with a move to league leaders Manchester City, who failed in their bid to sign him in the summer. After three draws and just one win from their four previous Premier League outings, this was arguably an important game for the Gunners in their bid to remain in the hunt for a top-four finish, especially after wins for rivals Tottenham, Liverpool and Chelsea in midweek. They started the day with six points fewer than they had at the same stage last season – and Wenger’s side ultimately finished outside the Champions League places – so a positive result and performance was needed to help ease any Arsenal fans’ concerns their campaign was in danger of fizzling out. For large periods, the performance was certainly there. The visitors often produced some of their best attacking play of the season, particularly in the first half when Palace could not cope with short, intricate passing that time and again opened up the defence. But their inability to finish off the many opportunities they created meant their opponents always had a chance to get back into the game. That proved the case early in the second half when Zaha’s cross caught Arsenal’s defence asleep and Townsend struck. A five-minute spell of Arsenal disarray followed and the Gunners could easily have found themselves falling behind, but Sanchez – so often Arsenal’s saviour – settled the nerves with two moments of quality. But even with a two-goal cushion Arsenal were never at ease, and Wenger’s concern about his side’s defensive frailties was highlighted by his decision to replace striker Lacazette with Francis Coquelin late on. That was still not enough to prevent Palace from reducing the deficit to one, setting up a tense finale. What Places Do You Remember Fondly From Childhood? From Kuwait, I definitely remember the Kuwait Towers and Entertainment City. The latter was a child’s delight with all their games, Ferris wheel, log rides, so many arcade games and lots of other cool stuff. I don’t remember much about the Kuwait Towers except that during the only visit that I had, we had lunch on the revolving restaurant and that height and the experience, it was a lot of fun for a 10 year old. Oh and I can’t forget Safeway! Yeah, especially because they had a toy section with comics as well and I loved spending a lot of time there. I also remember they had a lot of candy and chocolates and I bought a bunch of them the last two times we left Kuwait for India. I loved the ride to Safeway and back. In India, it’s always my grandma’s house during summer with my cousins, Boston video library, Atlantic Records, Cool of Cools, Fort Kochi beach and Periyar river. Good times! On The Highway – Beef patty, salami, onion rings, fried egg, lettuce & cheese with French Fries on the side. A big burger that is a 9 outta 10. Cafe 17 never lets me down. Banana & chocolate shake to wash it down. I haven’t watched a Jackie Chan film in ages. I respect the guy and the torture he puts himself through in some of his action movies and he is hardworking as hell but I haven’t wanted to watch any of his stuff in many, many years. The Foreigner is a 2017 action thriller film directed by Martin Campbell and written by David Marconi, based on the 1992 novel The Chinaman by Stephen Leather. 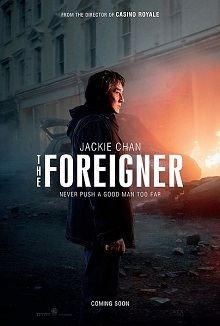 The British-Chinese co-production stars Jackie Chan, Pierce Brosnan, Michael McElhatton, Liu Tao, Charlie Murphy, Orla Brady and Katie Leung, and follows a businessman who seeks revenge for the death of his daughter. Quan’s daughter Fan is killed in a bombing of a bank (she was in the store next to it) the former retired Vietnam War special operations forces soldier who now runs a Chinese restaurant in London, is devastated. His now dead wife and he were shot as Thai pirates boarded their ship, that was taking them and other migrants from Vietnam to Singapore many years ago, and stole their two young daughters. Fan was his third child and his wife died during childbirth. A group of rogue IRA activists calling themselves the “Authentic IRA” claim responsibility. Quan tries to bribe Scotland Yard officer Richard Bromley for the names of the bombers but is rejected and told to stay away while the investigation is going on. Quan next focuses on the Northern Ireland deputy First Minister Liam Hennessy, who speaks publicly about his status as a former leader of the IRA forces while condemning the bombing. He haunts the Minister after being rejected on multiple occasions and bombs his office, and threatening more unless he gets the bombers’ names. Hennessy, while having ordered the bombings to come with warnings as part of a political ploy to solidify the radical factions, does not actually know who the bombers are, as they are rogue members of the IRA. He is in fact outraged that no warnings were given and civilians were killed. Hennessy tries to identify the bombers by changing the code words they use after any bombings are carried out, but the rogue members catch on and outwit him. Meanwhile, he sends numerous mercenaries and personal enforcers after Quan, who manages to escape or defeat all of them. Quan then brings the fight to Hennessy, hiding in the woods outside his Belfast farmhouse and attacking it with more homemade bombs. As Hennessy’s men attempt to track him in the woods, Quan uses traps to disable a group of three and attempts to interrogate one of them, but he is shot in the shoulder by a fourth mercenary and flees. Hennessy decides to send for his nephew Sean Morrison, who was part of the Royal Irish Regiment with Bromley, after Quan in hopes that his tracking skills can be used to stop him for good. A second bombing, this time a double decker bus in London sees Hennessy contact British politician Katherine Davies, and promises the capture of the bombers in exchange for the pardoning of some of his former IRA comrades. Bromley’s team manages to identify the bombers and relays the info to Hennessy who then relays the information to Sean. After a knife fight in the woods, Quan manages to capture Sean, who reveals the name of one of the bombers: Patrick O’Reilly, who was also behind the bombing that killed Quan’s family. Quan lets Sean go out of mutual respect. ennessy, meanwhile, interrogates his head enforcer McGrath, discovering that the true mastermind is Mary, Hennessy’s wife, who also hired Maggie; she has never let go of her anger at the British for the death of her brother and resents Hennessy’s working for them. Hennessy executes McGrath for his betrayal and for involving his wife and mistress, then orders Sean to execute Mary—with whom Sean is having an affair—before returning to America. Quan manages to get to the bombers before the cops under the pretense of fixing a gas leak and single-handedly kills all but Maggie. The police raid the apartment and find a severely wounded Maggie, whose real name is Sara McKay. They torture her into revealing the location of their next bomb, which has been planted in a laptop to be detonated on a plane heading to a security conference and they are able to get to it in time. With the threat resolved, Bromley orders the operation leave “no loose ends” and Maggie is executed. Hennessy gets a call from Davies, who tells him that he will retain his position as a politician but will be under her thumb. However Quan confronts Hennessy and forces him to post a picture of himself kissing Maggie to the internet, telling him that he should be ashamed of himself and the whole world will know that he is a terrorist. Bromley realizes Quan’s role in the events and has him put under surveillance, but decides not to take any further action. The film ends with Quan returning to his restaurant, and Lam embracing him as he puts the past behind him. Good action and fights. I found the whole political angle and the IRA bombing business more interesting that Quan’s quest for revenge. A 7.5 outta 10! Well back to work I go. It’s only been three days but I feel lazy. Also, I have not enjoyed them as much because a)Saturday I slept most of the day away having woken up up only by 1:45 pm (whoa!) and then feeling so tired that after brushing my teeth and having lunch I went straight back to bed, though instead of sleeping I watched a movie and some tv before getting up at around 5pm. Saturday I slept late, by 4 am, watching movies all night and Sunday I went out. Monday I was in for Yule and after a nice big lunch of fried chicken, fries and beer I slept for 90 minutes. And we have had mosquitoes, buzzing around all late evening and night making it hard for me to sleep and enjoy myself. Sheesh! And it’s been warm. Well altleast the day time is fine, the mornings are actually breezy. I watched 6 movies this 3 day weekend – Jeepers Creepers 3, James Bond : A View To a Kill, Demolition Man, Gremlins, Indian Jones & The Raiders of The Lost Ark & Alien. That’s a good variety of films don’t you think? Now it’s back to work and I don’t want to go! Turkish club Galatasaray have offered to employ their former player and Ivorian International Emmanuel Eboue. The club is reported to have offered the player the role of an assistant coach for their under 14 side. The story of Eboue’s financial and familial woes was headlines over the weekend after the U.K. Mirror reported that the club-less defender was on the brink of suicide after losing all his earnings in a bitter divorce case. A soccer website, Futbolarena Turkey, said Eboue will begin work as he aims to obtain a coaching licence. The Istanbul side will rope him in, give him an accommodation and a decent salary as he works his way up the ladder. He had a playing stint with the Turkish giants between 2011 and 2016 having transferred from Arsenal. He played 77 games and score four goals during his stay. The ex-Arsenal man admitted to being pushed on the brink of committing suicide given the turn of events. “I want God to help me,” he says. “Only he can help take these thoughts from my mind,” he told the Sunday Mirror. He said a court has awarded all his earnings to his estranged wife adding that he has not seen his children since June this year. He is currently unable to play due to ill-health and also has a FIFA ban around his neck after a row with his agent. The player said he had no money to hire a lawyer and bailiffs were after him to serve him with documents to hand over his apartment to his wife. He admits to being naive with money and signing all documents that his wife presented to him. He adds that he more often than not signed bank documents without knowing exactly what they said or meant. His wife Aurelie has yet to respond to the allegations. Well, happy 25th of December to everyone wherever you are. Just another Monday but I get the day off so I am happy about it. Today I was planning on just staying at home and enjoying myself with some movies and buy dinner via home delivery and drink a couple of beers. Well my folks ended up going to a relative’s house along with my sister and niece for lunch so I thought I’d buy some chicken for meself. 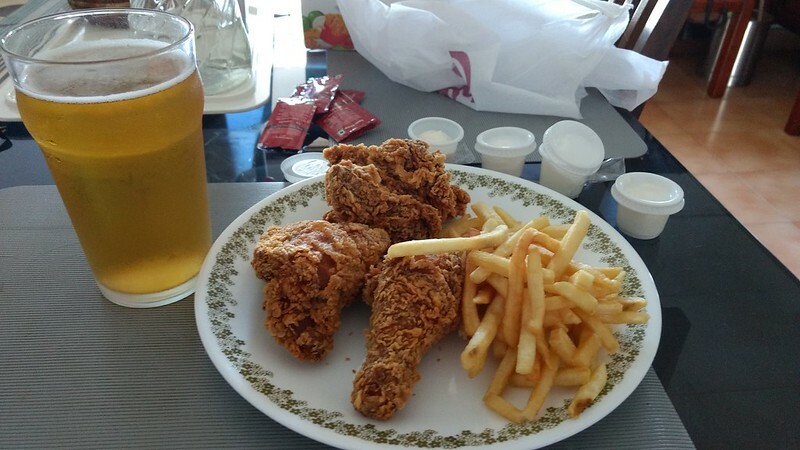 I thought maybe pizza from Dominos or Pizza Hut for a while, since they go really well with beer but I was really in the mood for fried chicken. So I ordered a three piece from Chick King with French fries, some mayo and garlic sauce in these small containers. It was yum! I drank my beer and ate my chicken and enjoyed a quite afternoon at home. I fell asleep at 3pm and took a long nap so I will be up for a while after I go to bed so I will watch a movie or two. Hope you all have had a good day. After a few weeks I finally went out for a while. Nothing special planned but just for some good food and a bit of shopping. I woke up very late as I had slept so late in the night or early morning. I finally fell asleep by 4 am after tossing and turning and only woke up by around 10 am. I had just a coffee and then showered and shaved and waited till almost 12:30 pm before heading out. I hired an Uber and went to The Burger Junction in Panampilly Nagar. On an empty stomach a nice, juicy burger with bacon and fries and a sweet Nutella shake is awesome. I spent some time there before leaving for Center Mall. I shopped for some secret Santa gifts and ended up selecting a customized coffee mug and a men’s wallet. After that I went to Big Bazaar two floors up and bought a few things like shampoo, deodrant, talcum powder, apples, snacks and chocolates. Then I went to Subway as I was still a bit hungry and had a Mountain Dew and a club sub before hailing another Uber and going to the self service BevCo in Gandhinagar and bought six beers. Hmm it’s been a while since I had any. Then I made my way back home for some relaxation. In the late evening while watching YouTube I downed a couple of those beers and then had dinner by 9pm. Now watching movies. Jeepers Creepers 3 is a 2017 American horror film written and directed by Victor Salva and the third installment in the Jeepers Creepers franchise, taking place in between Jeepers Creepers and Jeepers Creepers 2. Jonathan Breck reprises his role as the Creeper. The movie stars Meg Foster as Gaylen Brandon, Gabrielle Haugh as Addison Brandon, Stan Shaw as Sheriff Dan Tashtego, Joyce Giraud as Deputy Dana Lang & Gina Philips appears in a cameo at the end. Set between the events of the first two films, the movie initially shows us a scene from 23 years before the events of the film in which the Creeper takes a victim and a man finds sees a severed hand fall from the sky. Now, 23 years later the police discover the Creeper’s truck filled with dead bodies. The truck is booby trapped and a cop is injured. Sheriff Dan Tashtego, who has just arrived with a small group of soldiers informs Sergeant Davis Tubbs that the creature is thousands of years old and must be stopped. However the truck, which is headed for the impound by a tow truck and a deputy is attacked and the Creeper takes the driver as Deputy Lang watches in fear. The next day, Gaylen Brandon sees a vision of her son Kenny, who was killed by the Creeper twenty-three years earlier. He warns her that the Creeper will return soon to uncover something buried on the property and will kill anyone there, including her and her granddaughter, Addison. 4 teenager bikers find the truck in a field and approach it only for one of them to be harpooned and the rest killed off by the creature. Addison goes into town to buy hay for her horse. When she can’t pay for it, her friend Buddy helps her out and the two drive up to a plantation house to deliver more hay. There they find the owner and a couple other men hiding under cars, but before they can get help the Creeper arrives and abducts Addison, leaving Buddy traumatized. Gaylen shows the officers the severed hand which when held gives a person secrets about the Creeper in a vision. Addison meanwhile wakes up and finds one of the bikers, Kirk, in the truck and they try to escape but Kirk ends up being speared in the head by a boobytrap. Tashtego and Tubbs discover the Creeper’s location and with the soldiers they approach the truck and shoot at it but the bullets rebound against the strong metal and a solider wielding a large gun is killed. The creature explodes a device that falls under their car and Tashtego and Tubbs find them knocked over in the field. Tubbs gets out and tries to shoot the Creeper, but all of his attempts fail. Before the Creeper can kill Tubbs, Tashtego calls him and he goes for him instead. When the Creeper jumps into the air, Tashtego shoots him several times with the machine gun, but the bullets have no effect and he is tackled to the ground and struck in the head with an axe. When the Creeper stands he removes his axe from Tashtego’s head and walks away, while Tubbs watches from afar. At night Addison escapes when the Creeper attacks her inside the van but she causes the spear to shoot out and impale him in the head. Even this only temporarily phases him but she escapes, doges his spear and is found by Gaylen & Buddy. The Creeper is hit by a truck but he doesn’t die and kills the driver and rages in anger when he sees a sign that says “We know what you are”. The next day, Addison says goodbye to Buddy as he leaves for a high school basketball game in the same bus that is attacked by the Creeper in the second movie. Twenty-three years later, Trish Jenner is seen typing a letter on a computer calling for people to fight against the Creeper when it returns, and vows to get revenge on the Creeper for the death of her brother, Darry. Which means we could have another sequel and I hope so. This is one of my favourite horror franchises, especially the first one which I think is awesome. The second was ok and this one lacked much tension or horror and is more or less a slasher film with a supernatural being at the helm. It’s good enough for a 6.5 from me. Roberto Firmino’s powerful finish earned Liverpool a draw in an incredible Premier League encounter that had seen Arsenal score three goals in just five second-half minutes. The Gunners had been trailing 2-0 after Philippe Coutinho scored his first headed league goal in England before Mohamed Salah added a second early in the second half with a deflected strike. But Arsenal suddenly came alive as Alexis Sanchez headed in Hector Bellerin’s cross from close range before Granit Xhaka’s thumping strike was too powerful for Simon Mignolet’s weak save. Barely two minutes later Mesut Ozil put Arsenal ahead with a neat clip over Mignolet. 52 mins: Salah races on to Firmino’s superb pass and makes it 2-0 with a deflected finish. Arsenal, who have not had a single shot on target, look beaten. 53 mins: Out of nowhere, Arsenal are back in it. Sanchez is well placed to nod in Bellerin’s cross from close range. 56 mins: What’s going on!? Arsenal are level! Xhaka tries his luck from 25 yards and the ball fizzes through Mignolet’s hand. 58 mins: Goals! Goals! Goals! Arsenal are ahead as Ozil is on to Alexandre Lacazette’s backheel before clipping the ball over Mignolet. The Gunners were no doubt helped by Liverpool’s poor defensive performance, but Arsene Wenger praised the character of his side to stage such a fightback. I am not religious and neither do I celebrate Christmas for family reasons because a) I am an atheist and b) my family is Hindu and not Christian so even the cultural thing doesn’t come into the picture. I am grateful for any holidays I can get (just the 25th & the 1st for this year) to relax and drink some beer and eat some good food. Repeat that for the next weekend as well since New Year’s falls on a Monday. Yipee! Part of the fun of this time of the year is to watch Christmas movies. For me and some others it’s not the traditional kind of Christmas movie or involving a Santa atleast. My movies are usually Gremlins, Die Hard or Home Alone. It’s always these three for me and I alternate between the three each 25th. Off the top of my head I can only think of these three but I guess the Dutch horror film Sinter Klaus is another option. What are your Christmas movies? Manager Arsene Wenger says Arsenal cannot afford further injuries over the busy Christmas period after striker Olivier Giroud suffered a hamstring problem in their Carabao Cup quarter-final win over West Ham. Wenger, who made 11 changes from the weekend triumph over Newcastle, saw his side struggle to break down the defensively resolute visitors in the first half. But England forward Danny Welbeck broke West Ham’s resistance just before the break, turning in Mathieu Debuchy’s header across goal as the hosts stayed on course for a first League Cup win since 1993. The Gunners’ night was soured by the loss of Giroud to an injury that could rule him out for three weeks, while Francis Coquelin also limped out of the match late on. With Arsenal embarking on a run of 10 games in 36 days, Wenger admitted the loss of Giroud had come as a blow. West Ham boss David Moyes also named a much-changed side but they failed to click in attack, with the belated introductions of Andy Carroll, Diafra Sakho and Marko Arnautovic unable to undo the home defence. Neither Joe Hart, restored to the West Ham side for the rested Adrian, nor Arsenal’s second-choice goalkeeper David Ospina were forced into much action in what was a disjointed contest. Moyes’ side had been content to sit back and try to catch Arsenal on the counter during a low-quality first half, but even with the attacking changes they could not muster a single shot on target. Arsenal will face Chelsea in the semi-finals. The Blues host the first leg in the week commencing 8 January. The second leg is two weeks later. Manchester City and Bristol City meet in the other semi. 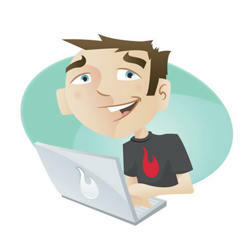 What Would Your Personal Mascot Be? A Golden Retriever. Just like my beloved Shawny who was my best friend from 1994 till 2005. And who set the standards for love, loyalty and devotion. That’s what I want to be known for and my personal mascot should also have those characteristics. I have never known a day that went by when she was with me, that she didn’t cheer me up with her love and affection. When I was sad, she was there with a wagging tail and a loving lick saying “Cheer up human”! When I came home from work post midnight, anytime between 2:30 am to 4:00 am, as I reached the gate in the company cab, Shawny would be waiting there for me. Everytime, without fail, at the gate. With a look on her face that would be either “I am been waiting for you all day, hurray that you are back” and in her later years “Finally, where have you been all this time, young man?”. I need a dog in my life but for long it has been as if I was replacing her. It’s not, as I have come to realize. And it would nice to have another dog for a few more years.